I may be in danger of becoming The Progressive Aspect’s default Chapman Stick Artist Reviewer. Personally I think that is possibly one of the coolest titles out there and that’s good because here’s another review of a “tapper”, and there’s another in the pipeline! I don’t want to diminish the contribution of anyone else involved with Pavlov3 by simply banging on about Matt Tate, but having said that; this is very much Chicago based Stickist Tate’s project. I’m fairly new to the Stick community and I’ll admit, I have not followed Matt up to now – but with this album I know that will now change. Matt is well known in Chapman Stick circles. With a background as a guitarist, Matt decided about 15 years ago to drop the guitar and dedicate himself to the Chapman Stick. His aim: to become a big fish in a small, Sticky pond. For the last couple of years Matt’s project has been called Pavlov (note the absence of the digit “3”). Pavlov is ostensibly a duo made up of Chapman Stick and drums. Pavlov appears to be more of a concept than a band. On this debut album Pavlov3 is made up of Matt and Paul Szlachta on drums. Markus Reuter guests on Touch Guitar and bass synth on two of the tracks, Reuter is best known for expertly filling the vacuum left by Michael Bernier in Tony Levin’s Stick Men. So; first impressions of Curvature-Induced Symmetry…Breaking? I’m not an advocate of this “first impressions last” philosophy. Just as well as mine were useless in this case. There’s an incredibly short moment at the beginning of the opening track where I thought I knew where this album was going. Almost instantly I was thrown. I’m not a Hi-Fidelity Nazi but I started listening to this a few days ago in my car and it was soon apparent that this album needs a better listening environment to do it full justice. I’m listening to this using pretty good headphones and I am so very glad that I made the switch; I can hear detail previously muddied or lost in the extraneous noise of wind and tyres. In fact, the production captures the intricacies of the complex melodic patterns. The bass just sounds absolutely awesome (I’m going to have to befriend Matt Tate and ask how he gets that bass sound). It is mind-blowingly good. The high production values and mixing on this album apply throughout, from capturing the full range of frequencies and the reverberation of every skin and each string to the intelligent use of panning, each sound being carefully placed in the stereo mix to maximise its impact. And if you wondered whether Pavlov3 can do any of this live, well it seems that they’ve been doing it for a while already, cunningly disguised as Pavlov and trialling their music in a live environment. Take a look at this video. 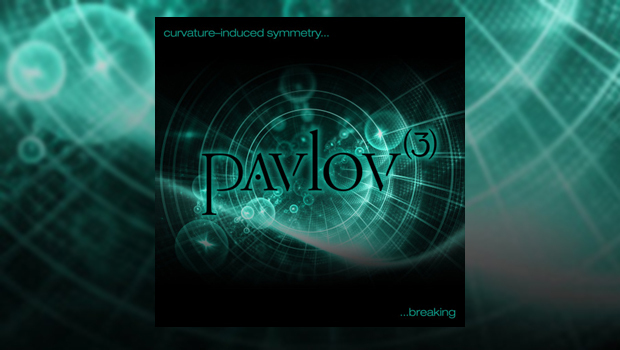 Here, Pavlov performs Song 1 which bears an uncanny resemblance to the Pavlov3 EP track #5, Unruhe. I think it might be the same band. Back in the 1980s King Crimson left our jaws on our chests with their innovative use of arpeggiated guitars and Stick. In places the polyrhythmic approach hinted at what would be possible if musicians just took a step back and looked again at how they make music. Pavlov3 takes that initial premise, infuses it with a hint of Jazz and a bucket-full of metal and lets rip. Those of you who read my review of the Isaac Vacuum EP may also have discovered a new generation of instruments and players in the World of Music. Skilled in these new techniques and using bespoke instruments designed for tapping we are starting to hear a new music. If you liked Isaac Vacuum then you should definitely want to consider downloading Curvature-Induced Symmetry…Breaking. It doesn’t relax its levels of intensity, this EP is just full-on for just about the entire 30 minute running time. My apologies to Pavlov3. This review is a little late, given the release date was at the end of 2015. Hopefully it will serve to rekindle interest – if that is needed at all – these few months on. Better late than never, because this is another band you should try out. They are not for the faint-hearted – but I highly recommend them.